(Text automatically translated) "It Fienile" is an old farm structure completely restructured: the ideal place for an unforgettable stay for all who want to enjoy unhurried calm of the house and its large open space, or enjoy the shade patio and garden scents of property between a visit to one of the many cities of art around a tower gourmet bistros to the village, or even a bath at the side or in the clear water and transparent local rivers.Treat yourself to the luxury of putting aside the frenzy of urban life and let you take a moment, just a moment while a candlelight dinner in front of the sunset, to dream under a starry sky, or relax in the silence and peace of the countryside. 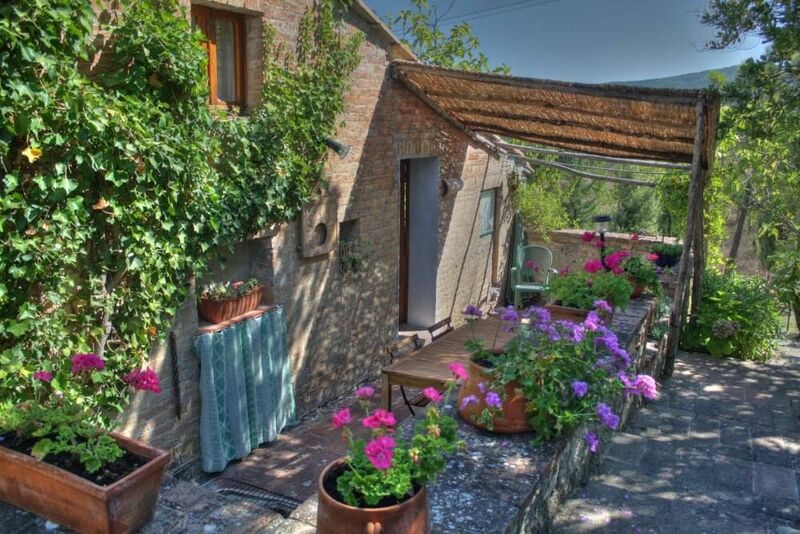 What a lovely property set in the remote Tuscan hills in close proximity to Radicondoli. The beds are both extremely comfortable including the pillows. The bathtub and shower are delightful with plenty of water pressure and enough hot water to fill the tub. The country style kitchen is equipped with all the modern conveyances you could possibly need to prepare lunch or dinner. In the evening you can prepare a cozy fire in the living area when it is chilly outside and enjoy you dinner by the fire. The outdoor space is exquisite with a charming patio just outside the kitchen entrance where you can drink your morning coffee in the sun (or shade if you prefer). The property grounds are well maintained with a wide variety of florae with tons of herbs and flowers. This area of Tuscany is in a “time warp” and the villages are unspoiled by modern society (I have been going to the Chianti region since 1969). Escape from the madness of everyday modern life and treat yourself to a serene stay in this charming cottage. Das Bauernhaus liegt unterhalb von Radicondoli. Anfahrt über eine Piste. Zu Fuß ist Radicondoli über einen kleinen Anstieg in ca. 10 Minunten zu erreichen. Ausstattung des Hauses gut. Aussicht direkt vom Haus nicht gegeben, da das Haus von hohen Sträuchern und Bäumen umgeben ist. Aber etwas oberhalb gibt es Plätze zum verweilen und Aussicht genießen. Francesca ist eine liebenswerte Vemieterin, die keine großen Umstände machte. Die absolute Ruhe um das Bauernhaus herum ist besonders erwähnenswert. Bien situé, le gîte, d'un charme fou, nous a permis de parcourir une bonne partie de la Toscane sur 2 semaines. Les propriétaires très accueillants et discrets. Tout était parfait ! Small and comfortable house located in beautiful Tuscan scenery. Calm and peaceful surroundings. Good location for visiting Sienna (1 hour), Florence 1.5 hours) , San Gimignano (1 hour) etc. Very nice cottage for a romantic stay. Quiet and rather lonely place with a beautiful garden, lots of herbs, flowers and birds. une belle maison dans un environnement magnifique qui nous a permis de découvrir la region de sienna. la maison est conforme aux photos et bien équipee. (Text automatically translated) Take the motorway Firenze-Siena towards Siena. Take the exit Colle Val d'Elsa Sud, turn right and follow Radicondoli to the entrance of the village. Skip the old fortified village (on your right) and sports fields (on your left) to the indications "Podere La Casina" on your right.Follow the road signs: here you are, park the car and relax. (Text automatically translated) The village of Radicondoli is located in the heart of one of the most unspoilt areas in Tuscany. Despite this, the village suffers no isolation:. Florence, Siena and a few of the most important art cities of the region, as Colle Val d'Elsa, San Gimignano, Montepulciano, Montalcino, etc., are in a radius of only 60 km and Pisa, with its International Basic info Airport is located 90 km, and the famous beaches of the River of the Etruscans are within an hour drive. However, a nice alternative can swim in fresh water from local rivers, moin to 10 minutes, or even in the hot water pools termales (Rapolano 50 min).For those who want more, the village of Radicondoli and its immediate surroundings offer a wide variety of entertainment (walking, hiking, tennis, biking, horse, etc..), In addition to the many bars, taverns and pizza (La Pergola Radicondoli), and the shops and services in the territory.